Clarke, who moved from Worcestershire during the close-season, remains undefeated on 109 as Notts reached stumps on 324 for five. 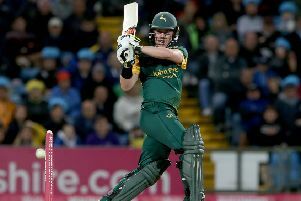 The 22-year old scored an unbeaten on 177 for his former club at Trent Bridge last year and once again enjoyed the Nottingham air, delivering an innings of high quality, having faced 181 balls and hit 17 fours. Steve Patterson, two for 62, and Duanne Olivier, who bagged two for 74, were the most successful members of the Yorkshire attack, with Matthew Waite picking up the other wicket to fall. Whatever happened at the start of the day was bound to include a spot of ‘After the Lord Mayor’s Show’ for Slater and his opening partner Ben Duckett after their exploits last weekend. The two left-handers added 325 against Cambridge MCCU at Fenner’s during their first opening partnership together. Those heights were never likely to be repeated but the near-certainty of Yorkshire wanting to bowl first ensured that a reliable Trent Bridge surface had been prepared to help blunt the visitor’s attack. Duckett looked in sparkling touch but paid the price for his first false shot as he picked out long leg off Patterson for 43. The openers had added 75 and a further 50 runs had accrued before Waite pinned Chris Nash lbw for 21. Slater’s 50 had occupied 112 balls and he looked destined to repeat last season’s feat of reaching three figures against the White Rose until he feathered Olivier behind to wicketkeeper Jonny Tattersall. Olivier, the former South African international who has signed a Kolpak deal to play for Yorkshire this summer, had been a little wayward at the start but found good pace and rhythm in the second half of the day and also removed Steven Mullaney after tea. Mullaney, the Notts skipper, had raced to 31 but pushed hard at his first ball after the restart and was smartly taken by Adam Lyth at second slip. Samit Patel made only 11 but then drove Patterson into the hands of Harry Brook at point, leaving the hosts on 249 for five, but Clarke offered the bowlers any encouragement as he crowned his home debut with 50 from 105 balls. 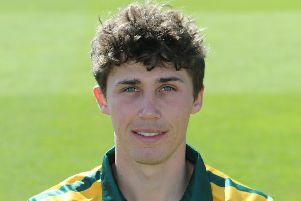 The 22-year old moved into the 90s with successive pulls through midwicket off Olivier and he reached his 14th first class hundred with his fifteenth boundary, coming from 165 deliveries. Notts ended the day as they had started it, with a stand of 75 – currently unbroken – between Clarke and Tom Moores, who has made 11.